FML. That’s what immediately popped in my head as I was watching this episode of ‘Match Game ’78’ on YouTube. BTW, I highly recommend the 70s ‘Match Game’ eps as quality entertainment…they never fail to make me laugh, and of course the set and the clothes/hair/everything of the guests and panel are absolutely a time capsule. But I digress…the actual top answer for the above question was “Love of” (my life). I mean, really, how times have changed! 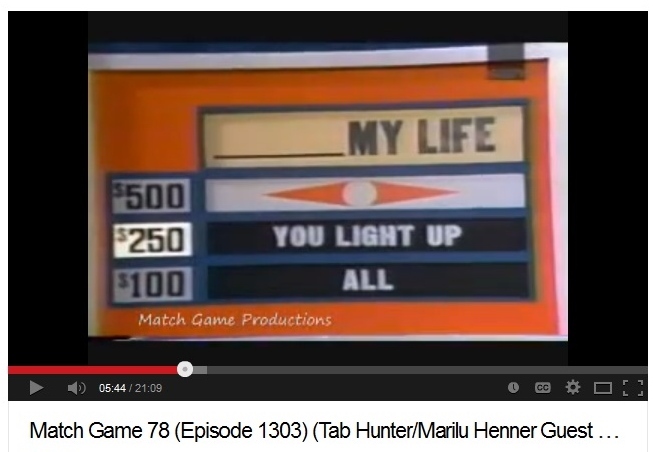 Tab Hunter was one of the guest panellists and he guessed, “You Light Up” (my life) and I thought he was joking. Then I remembered what a huge song that was back then. Everything’s relative, especially with word play. Heads up: I’ll have my annual year-in-review blog up next week, with some of the old “Best of” categories removed and some new ones added. No need for a “Favourite Movie” category when I’ve only seen one new movie this year. (‘We’re the Millers’ was funny, but I can’t pick it as my fave when there’s so many great Oscar contenders this year. I’ll leave the movie critiques to the professionals.) So stay tuned for that…obviously my opinions are no more important than anyone else’s, but the year-end blog is something I look forward to compiling each year, so the tradition continues. I think for anyone who reads this blog, it’s clear I’m still in love with him. He makes me want to be a better person. No one else in their right mind would go on and on about someone if they didn’t still have feelings for them. Part of growing up and moving on, however, is rationalizing those feelings and being realistic about the pros and cons of the relationship. I can stay friends with him because I care about him. But I do indeed owe it to myself to move on, as I told him after I received the resounding “no” of an answer to my not-so-hypothetical question. None of this is stuff I would mind him reading. 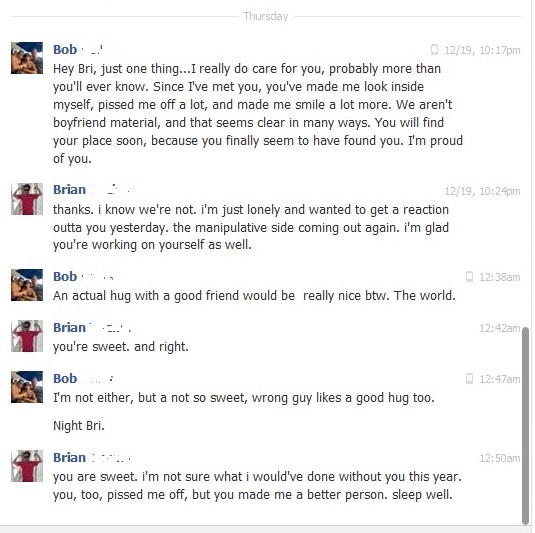 And if you’re covertly reading, Bob, don’t be mad I screencapped our convo from tonight. It was a heartfelt exchange and I’m proud to call you my best friend.